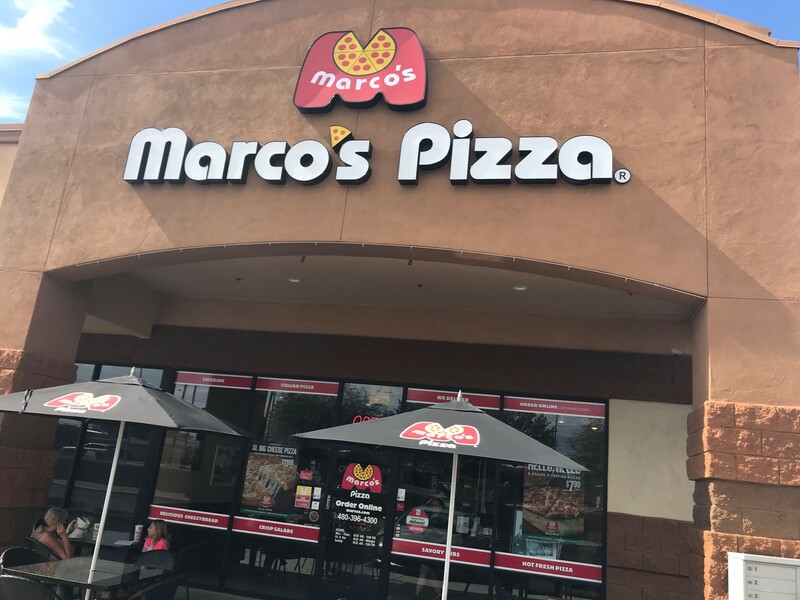 My intrepid companions Sally Harrison and Bob Nelson joined me on our Mesa Chamber foodie trail tour, this time to visit local favorite Marco’s Pizza located at the NW corner of Higley Rd and University Dr. This was my first visit to Marco’s and I guarantee it won’t be my last! This is comfort food heaven with something for everyone’s taste either on a take-out basis or in their inside or outside dining area. 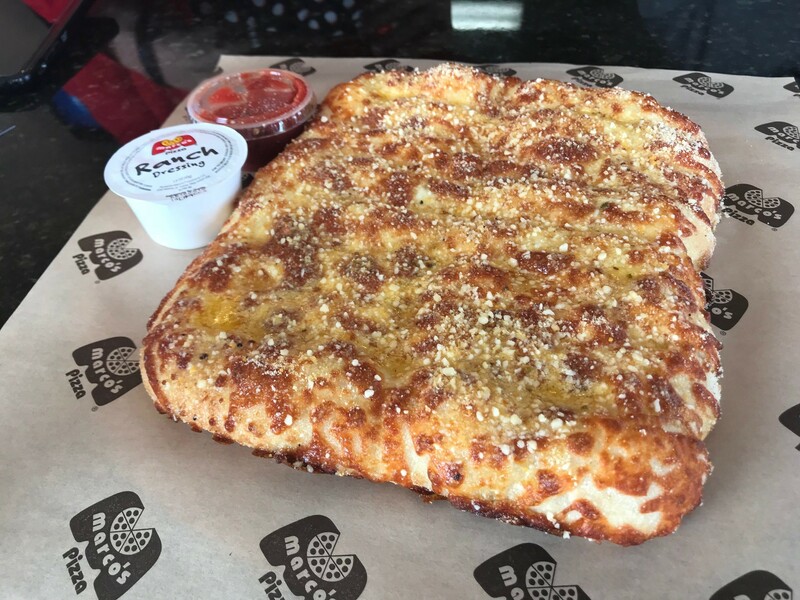 We started with an order of Cheezybread which consisted of fresh-baked bread strips with multiple cheeses and garlic butter and nicely seasoned with sauces for dipping. This was so good I am sure that it is illegal. But committing the crime was worth it! We had an order of barbeque wings which were meaty and with fairly mild sauce. More adventurous types might want the spicier sauce options. We sampled three entrees: two different types of pizza and one of their selection of sub sandwiches. We had the All Meat pizza, which included generous amounts of pepperoni, sausage, ham and bacon on a nice crusty base which was not too thick or thin. The sauce was their original sauce developed by founder Pat Giammarco when the company was founded in 1978. I found it to be tasty but not overpowering. Our second pizza choice was the Chicken Fresco, which includes cheese, grilled chicken, bacon, onions and tomatoes. I thought this was outstanding. All the ingredients were fresh and made a nicely satisfying combination of tastes and flavors. We had the Italian Sub, which consists of provolone, red onions, tomatoes, banana peppers, Italiano dressing, ham and salami. Quite simply this was one of the best Italian subs I have ever eaten. The veggies were fresh and crisp, and the meats and dressing very complimentary to the veggies. The next time I go to Marco’s I am going to have a difficult time choosing what to eat. And to top everything off, Marco’s is very engaged in the community providing assistance for many worthy causes. Clearly, Marco’s Pizza is an outstanding member of my Mesa Chamber of Commerce.